I think the people was happy to see people in pain and hurt. I THINK THEY PROBABLY DIDNT HAVE ENOUGH PEOLPLE TO DO IT THERE SELFS SO THEY GOT OTHER PEOPLE TO DO IT FOR THEM I GUESS. i think they didn’t do it there selves because that way they can get more people to harm when they didn’t have nothing to do. i also think they didn’t do it there selves because that way they can offend others. They want ppl. from other places as (Indigneous) ppl. to know that they are in charged and that they have power. They have so much power they can have others do exactly what they want! They bought slaves from africa because they were busy doing other stuff and they needed someone to watch over there plantation. I htink that they just wanted someone else to do their work for them. I think because they got bored of killing them there self that they put some other people to kill them . The Europeans just wanted to see people suffer. They just wanted people to do everything so they wouldn’t do anything. Spanish people was bored of killing peole. My opinion is dat day did that b-cause they were mean and mayb they did’nt c africans and indeginos ppl lik humans . I THINK BECAUSE THEY KILLED ALL INDIGINOUS PEOPLE SO THEY WENT FOR MORE PEOPLE TO BE SLAVES. I think that they probably wanted to feel like they were important, they probably got treated the same and wanted to get pay back but they shouldn’t get pay back with them if they weren’t responsible or maybe they were just lazy. Because they to lazy to do it they themselves. I think they had the Africans do their work, because it made them feel powerful, and because they didn’t have to pay them much for the hard labor. I think they did so because they didn’t do it because they needed people to work for them and because they just didn’t want to do it for themselves because i believe they didn’t want to have to go through the pain the slaves went through with picking the cotton. I think that they are to lazy to do it themselves. THEY DIDN’T DO IT THEMSELVES BECAUSE MAYBE THEY WERE TO LAZY TO DO IT THEMSELVES AND THEY DID NOT HAVE THAT MUCH MONEY. i think the spanish were very evil …..and they were happy because the indigenous people were working in pain…..
Mabe they thought at the time slavery was the right thing to do at the time. I think that they didn’t want to work because soon people would ask for money. And maybe they didn’t want to pay anybody anything. I think that they were really selfish. I GUESS BECAUSE THEY JUST WANTED TO SEE PEOPLE SUFFER AND STUFF.OR MAYBE THEY NEEDED HELP NOT REALLY BUT YEAH I GUESS BECAUSE THEY JUST DIDNT WANT TO DO IT THEMSELVES OR THEY NEEDED MORE HELP! They did not do it their self because maybe they were to tired and lazy. WELL I THINK THAT THEY WERE RICH AND THEY WANTED TO BUY OTHER PEOPLE SO THEY CAN DO CLEANING AND THE HARVEST FROM THEM AND IT IS SO WRONG TO DO THAT. I think it was because they thought that they were more important themselves. Also they maybe didn’t see others as people, only as like just slaves. Aside From Them Being Lazy, The Probably Found Joy Through Watching Other People Suffer….And They Were At More Risk Of Dying From European Diseases..So A Solution Would Be Buying People That Wouldnt Die Of European Diseases. They were busy killing African Americans. they just didnt want to do it they like looking at people suffer!!!!!!! WELL THEY DIDN’T DO IT THEM SELF’S BECAUSE THEY WERE TO BUST KILLING OTHER PEOPLE..
tehy wanted to be others superiors and rule over people.they were greedy and very self-centered.also they wouldnt have to pay anyone for the labor they were doing it would all be free. I think because they didn’t have anymore Indigenous people to use for slavery. I BELIEVE THEY DID THAT BECAUSE THEY THINK THAT THEY ARE TO GOOD TO WORK IN THE PLANTATION. they didn’t do it themselves cause probably they wanted to look like if they were supposly rich. but another reason could be cause they didn’t have to pay the y would just supply them with shelter and food.another sreason could be that they weren’t really important as them and that they could just relax. THEY DIDN’T DO IT THEMSELFS BECAUSE IT WOULD TAKE LONG TIME TO DO IT. AND IF THEY CAPTURE AFRICANS THEY DON’T HAVE TO PAY THEM AND IT WOULD BE EASY FOR THE SPANISH TO CAPTURE THEM. THEY PROBOBLY JUST WANTED TO MAKE THEM SUFFER………..
because they wanted to use africans for somethin to[just to torture them] and to make them do things they didn’t want to do. maybe they wanted to feel more important than the other people………. BECAUSE THEY HAVE MORE THING TO DO OR BECAUSE THEY KILL THE INDIGINOUS….. THEY DIDNT WANT TO DO IT THEM SELFS. THEY WANTED TO FEEL POWERFUL AND JUST WANTED TO LOOK AT THEM WORK HARD. THEY JUST DIDNT WANT TO DO THEIR OWN WORK….. THATS WHAT I THINK. …..THEY JUST SOME DIRTY AND SICK PPL.. I think that they didn’t do it because they thaught they we’re too good to do the work. The reason that they did not do it their selves was because they either wanted to kill people or they were too busy killing others. I think because they thought they were 2 good 4 all the farming thing so they decided they were going 2 get peeps 2 d0it 4 them…. 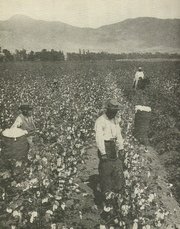 i think its because having slaves was probilly in fashion and every one else whanted them or probilly because the fild was to big for them to do it by they self.. They wanted the slaves to do it because they thought they were so special. Because they had other people to do ther work, so most of the spanish people dont know how to do some of ther work. I THINK THEY WANTED SOMEONE ELSE TO DO IT BECAUSE THEY WERE SCARY,AND ALSO THEY PROBALY DIDN’T HAVE ENOUGH PEOPLE!!!!!!!!!!!!!!!!!!!!!!!!!!!!! I think it was because everone wanted to take advantage of them or maybe they wanted to feel inportant so they wanted to have slaves. i think the spanish didnt do it becouse they were used to working outside in the fields nder the hot sun. the african were used to working in the fields back in africa so the spanish decided to go and force them into working for them. i think they didit becuse they thaught thay we’re too good to do the worke tham self and thay do knote kowe how to do eny thing tham self. IT JUST BECAUSE THEY DONT LIKE TO DO THERE OWN PLANTATIONS SO THEY GOT THEM SOME AFRICANS THEY wanted them to suffer. I think the reason why they didn’t do themselves becuase they liked to see the peolpe tourture. i THiNK BECAUSE THEY WANTED PEOPLE TO DO THEiR WORK FOR THEM…. they just didnt like doin thing there self they liked making other people do it for them. How did u feel when you had an dead body next to you? I think Kunta Kinte wouldv;e said I felt very sad that someone died on the side of me. I will tell him where were you when it all started ? people to some were safe.